Creating your life inside and out. Inspirational and practical workshops for professionals, mothers and teens. Interactive workshop sessions about exploring ways to create and achieve your life goals, increase confidence and bring these into your every day in a grounded, light-hearted setting. Create or review new goals, build confidence, learn about finance and open communication, discover fun tools and systems to help you implement – all wrapped up in a refreshingly inspiring day! For less than a pair of good shoes you can get your life totally sorted! Includes light refreshments, gift bag and e-book. Brought to you by Beautiful Minds, Savvy Sassy She and The 10thousandgirl Campaign. Savvy Sassy She is a movement connecting like-minded women with the tools, systems and ideas they need to create the lives they want. The coaching and events encourage connection, learning, fun and accountability to make great things happen in your every day. 10thousandgirl is a not for profit organisation committed to financially enabling women. 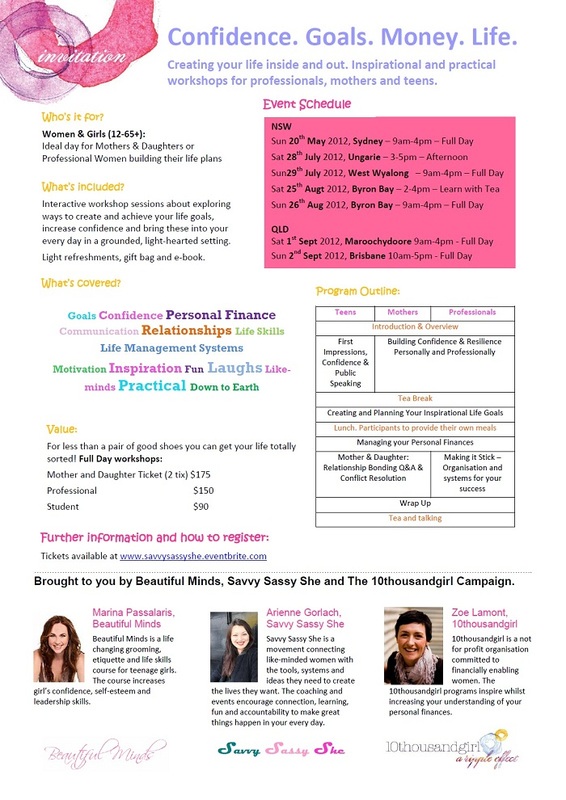 The 10thousandgirl programs inspire whilst increasing your understanding of your personal finances. If you are unable to attend the workshop with less than 72 hours notice to the event, there is a $30 cancellation fee applicable. If you haven't already, inspire your friends to come along too.